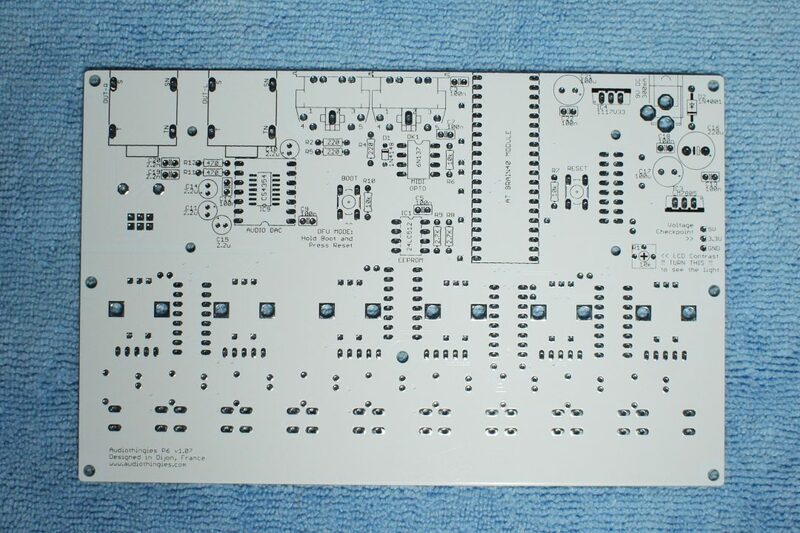 This guide refers to PCB version 1.07. 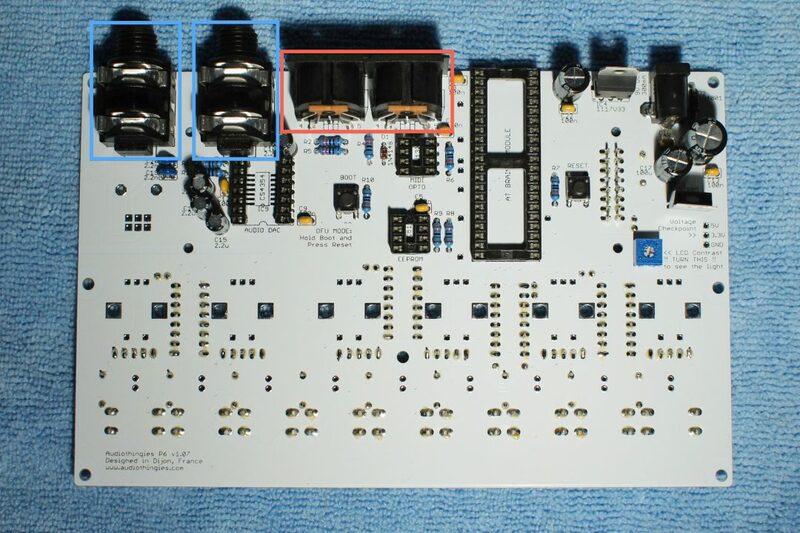 If you have a v1.04 board, please refer to this guide. 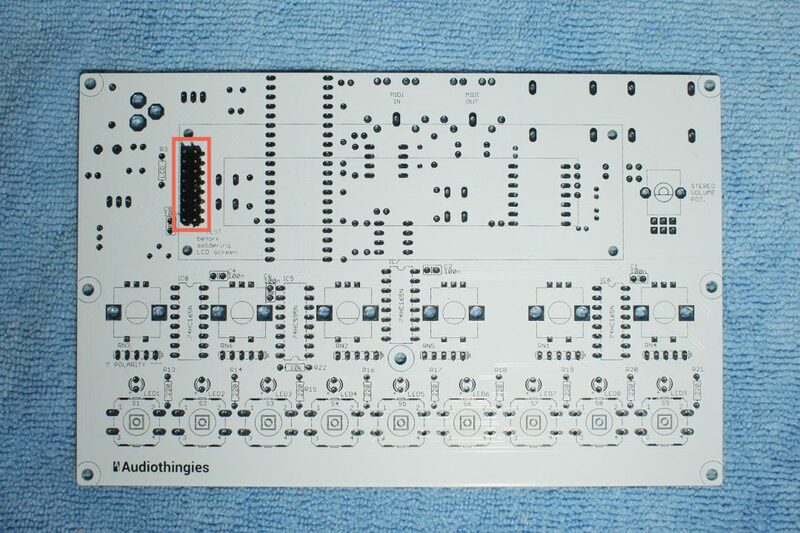 If you did buy an acrylic case with your kit, you additionally have the acrylic panels and a bag of screws and spacers. 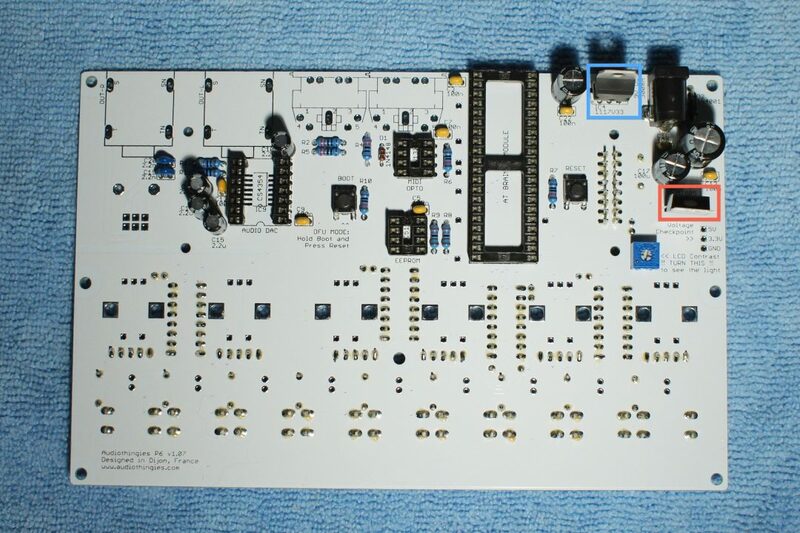 Building P6 is easy if you’re used to soldering. If you’re new to this, I recommend reading this tutorial. 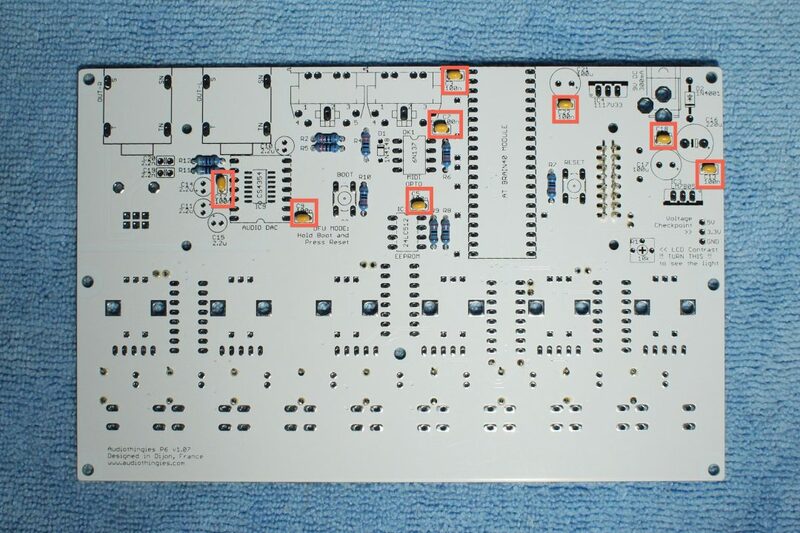 Take your time, read this guide twice before warming your soldering iron. 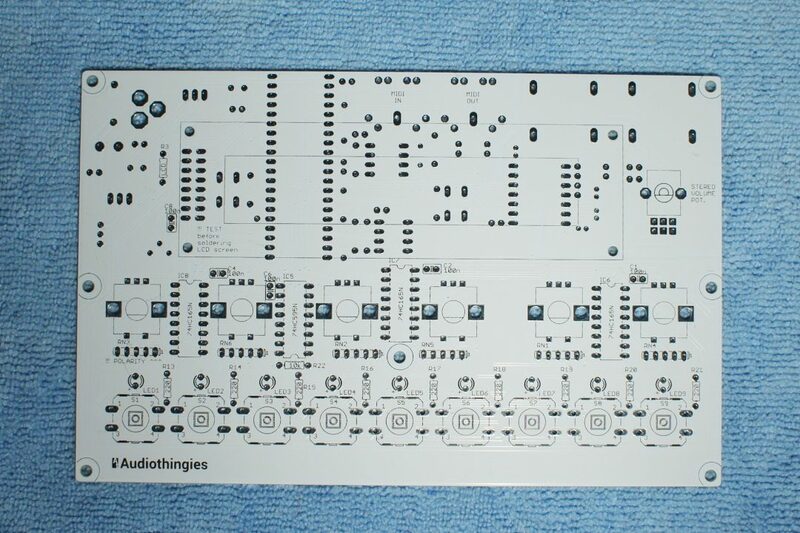 Take your time and be patient, you will have a fully functional synth if you follow this guide thoroughly , but a single little mistake can turn a few hours build into a days/weeks build. 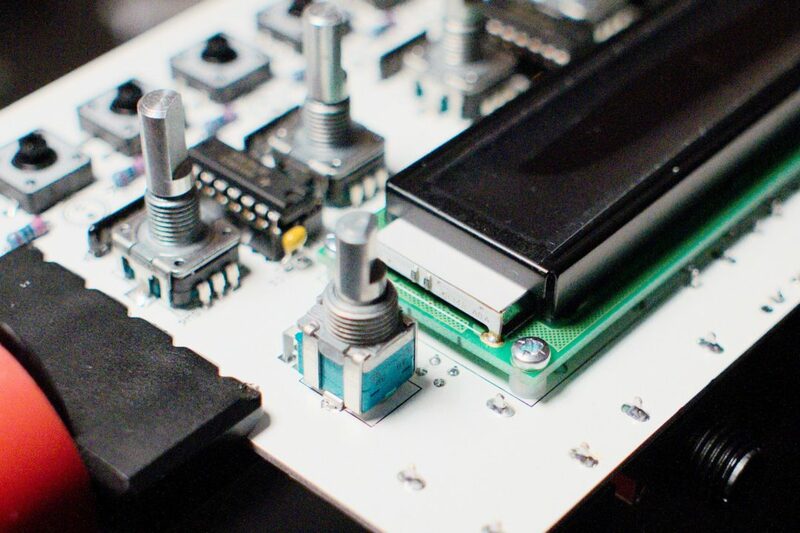 We will start by soldering the LCD pin headers (longest lead thru the pcb), as it can be difficult to solder it later. PLEASE NOTE: if your kit has a blue LCD, then it also comes with matching blue LEDs (they look white when off, but the light is blue). 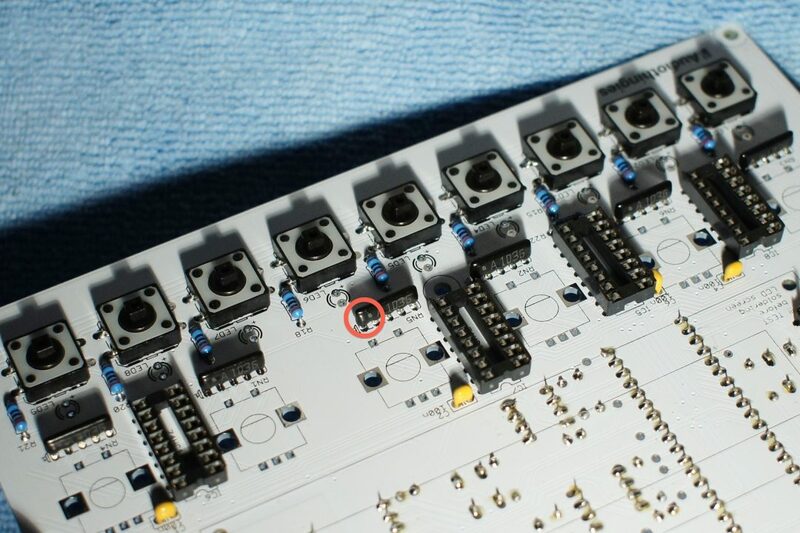 If you want to install those blue LEDs, then R13 to R21 must be 10k ohms (they are supplied in the kit), otherwise, the LEDs will be way too bright. Install the 100nF caps (marked 104). Solder C19 and C20 (2200p : marked 222). Those 2 are not polarized. 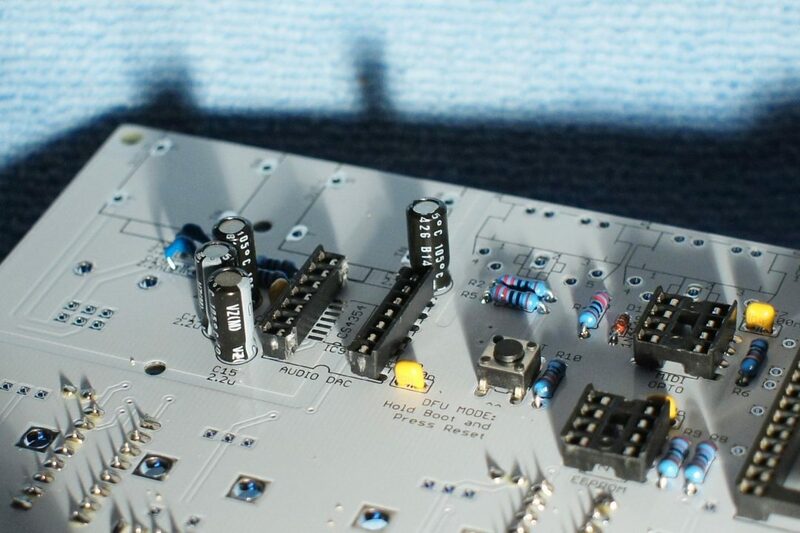 – RN1 to RN6: resistor networks. These are polarized. 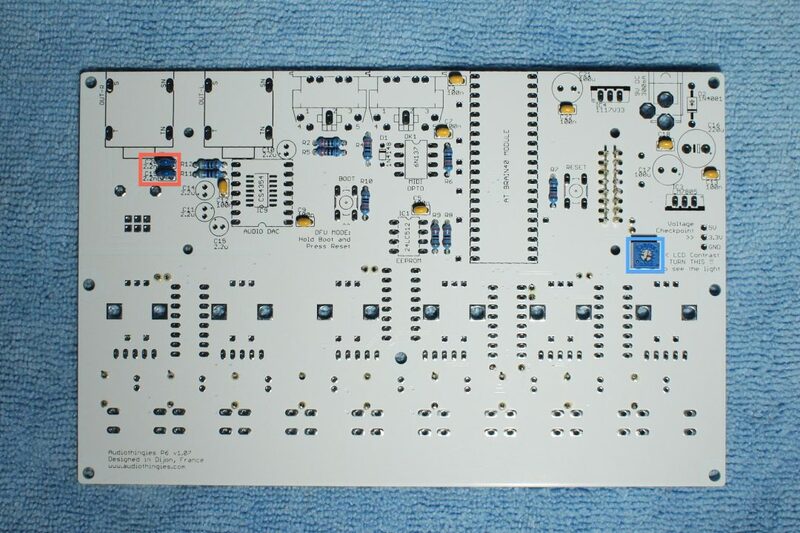 The side with a white stripe points to the right of the pcb (indicated with a little 1 on the silkscreen). 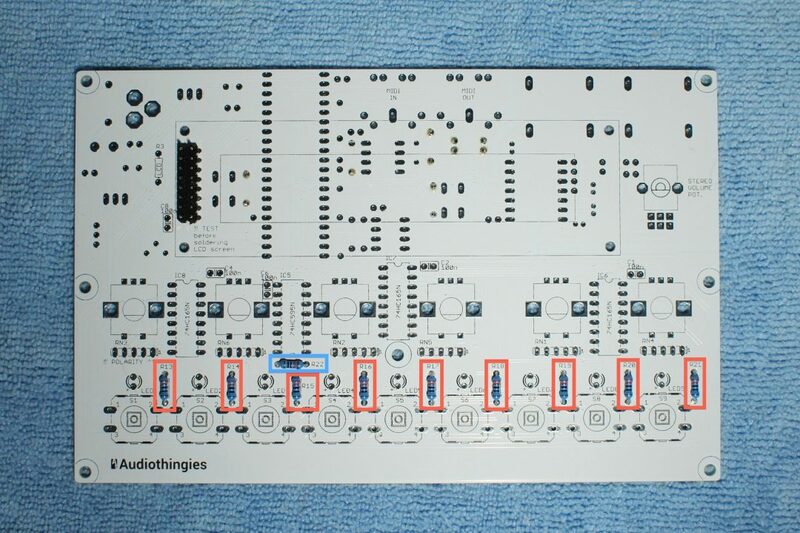 Also look for the close up in step 7 that should help getting the right orientation for the resistor networks. Install the switches and the IC sockets. Notice the orientation of the IC sockets. Here is a close-up of the top side. Notice the resistor network orientation. 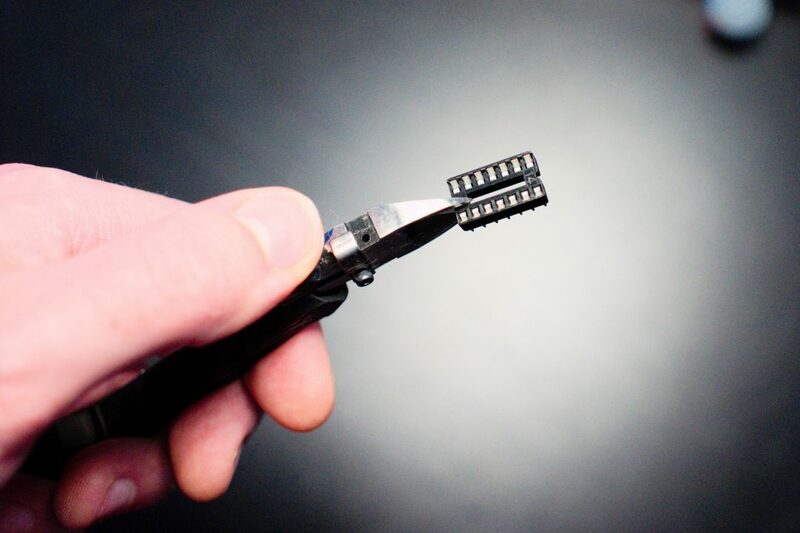 – J1 : Solder one leg, adjust the connector into the right position, then solder the other legs. Also look at step10 close ups to check for the correct orientation. 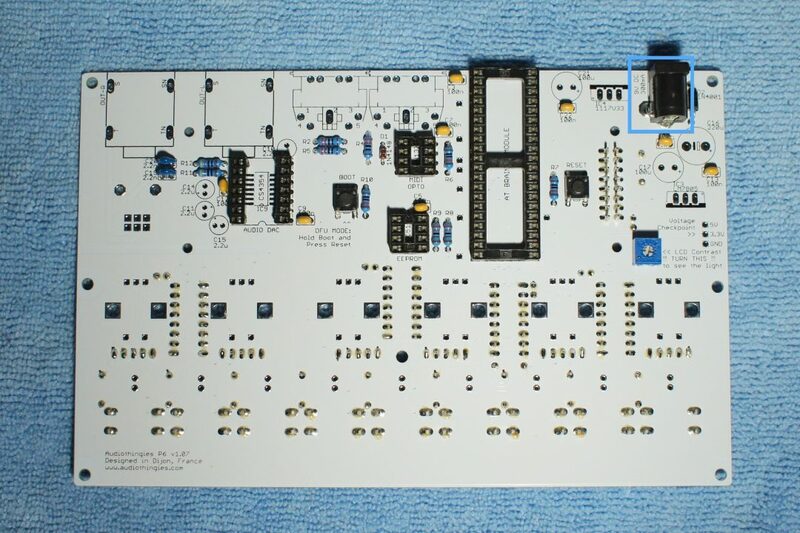 The board needs 2 different voltages, 5V and 3.3V. 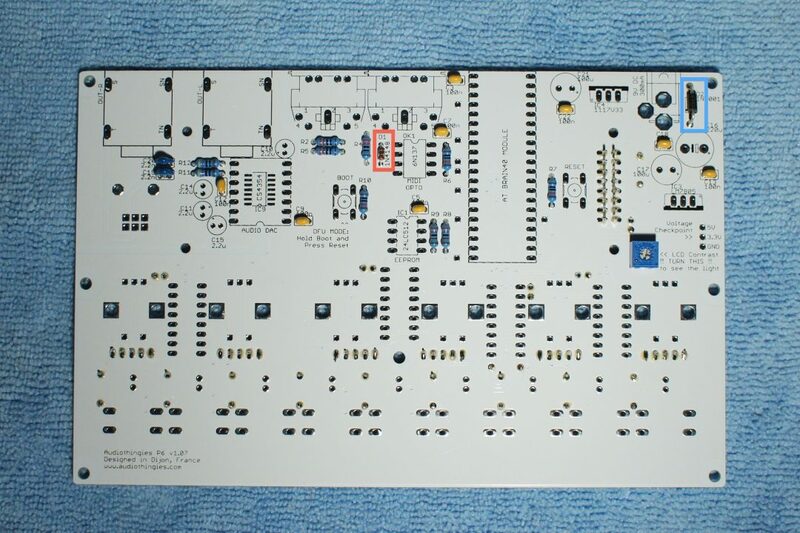 – IC3: 7805 “metal” plate points to the bottom of the board. 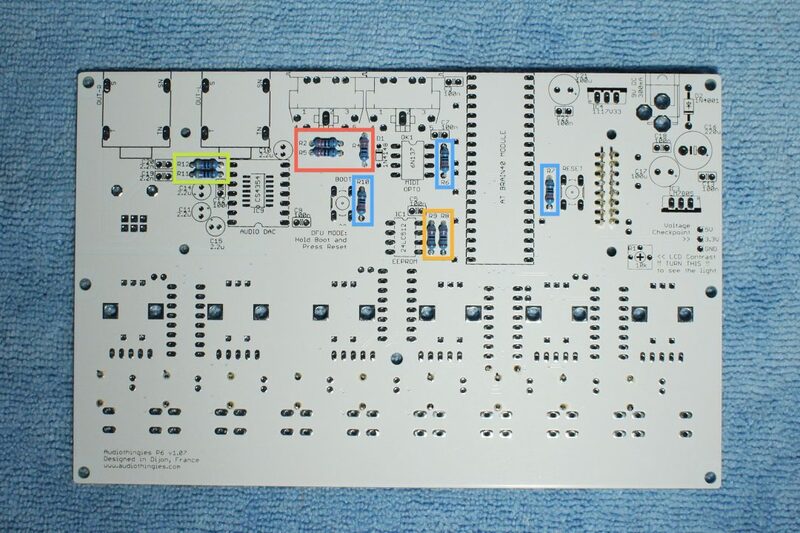 Do not invert the 2 voltage regulators, they look the same but they are not the same! At this point, look for short cuts between +5V, +3.3V and ground. 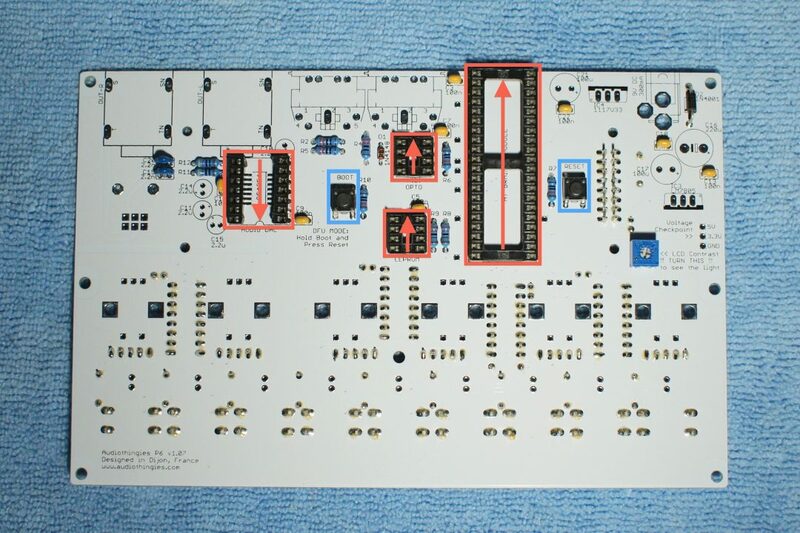 GND, 3.3V and 5V test points are available at the right side of this PCB side. 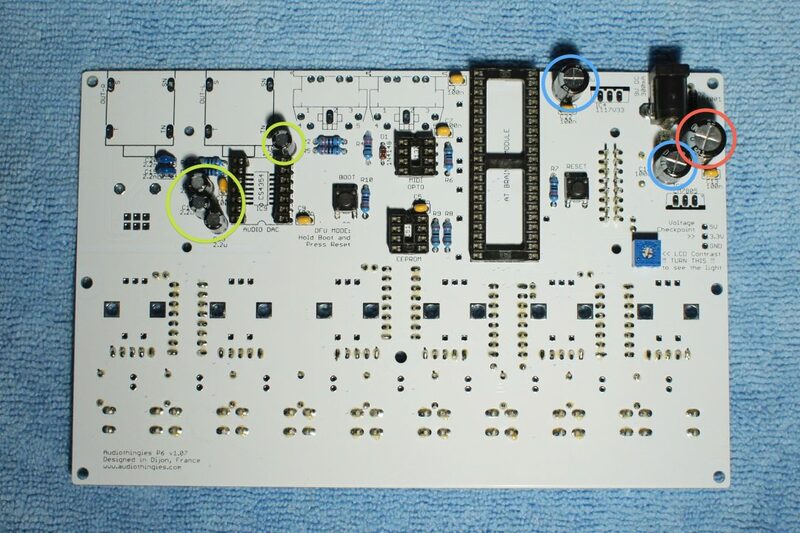 If OK, without any IC’s inserted, power the board and control the voltages using the same test points. You should read 5V (4,95 – 5,05) and 3.3V (3,25 – 3,35). You can remove the anti-rotation tag on the stereo volume pot with a pair of pliers. It’s time to insert all IC’s for a first test. 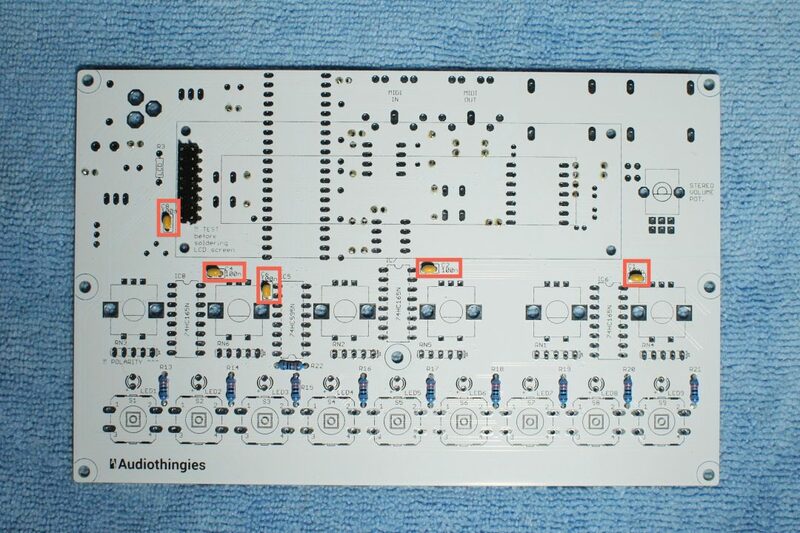 Pay attention to the chips orientation – that should be clear enough on the 2 following pics. 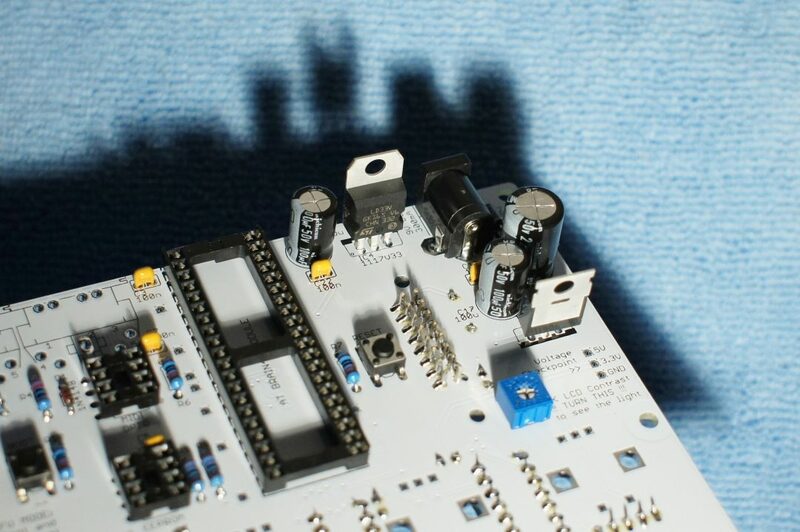 Power the board with a 9V DC adapter. 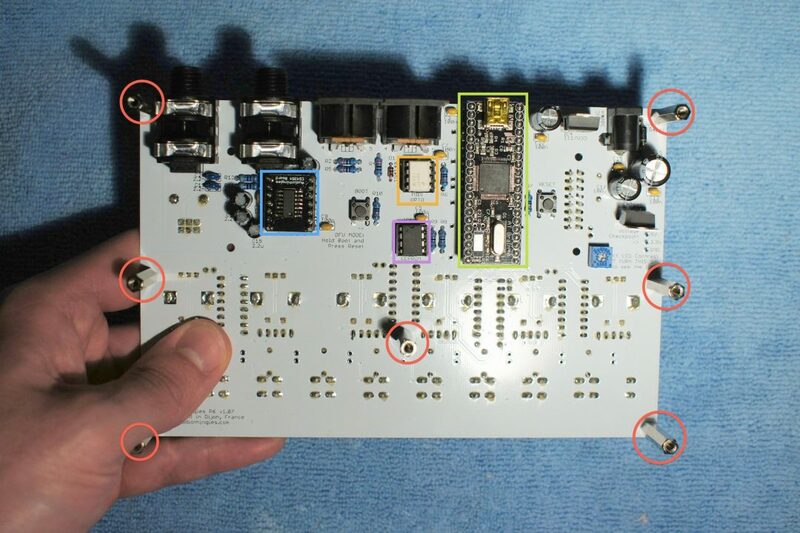 Measure the voltages on the DAC. 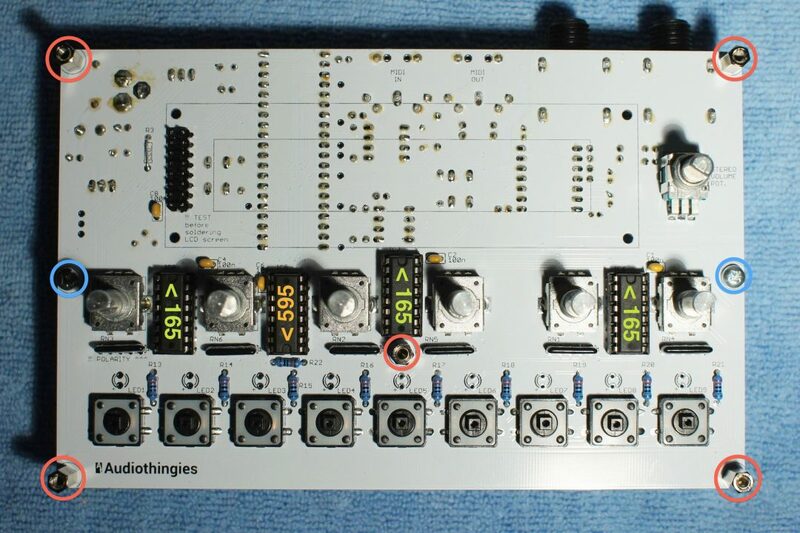 If you do not have these voltages, double check your soldering on the DAC pins and surrounding caps. 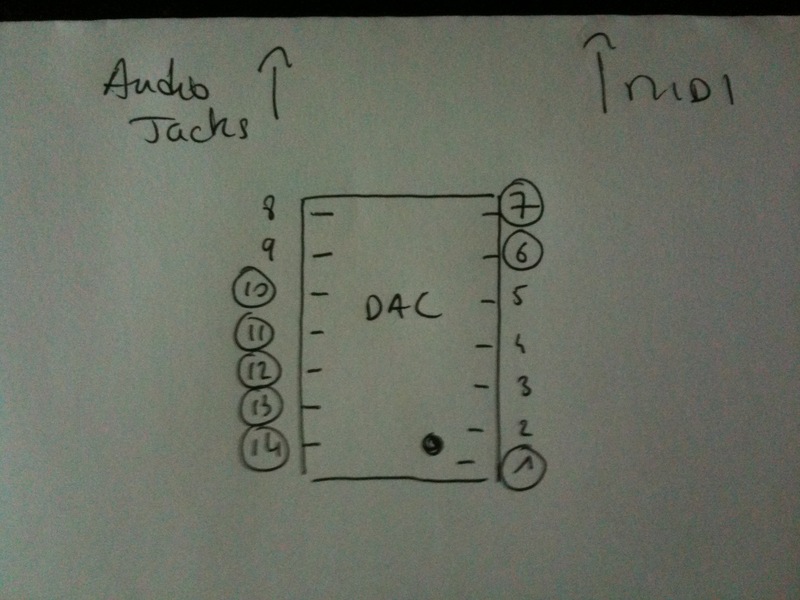 Then, if all good, connect a MIDI keyboard (channel 1) to MIDI IN socket (the one that is next to the mini-USB port), audio outs to a mix table. Play a few notes, you should hear a basic sound responding to pitch (don’t forget to turn the pot volume up – I always do). If you have the sound, then everything’s fine. Do not try to load any presets as this will not work yet. 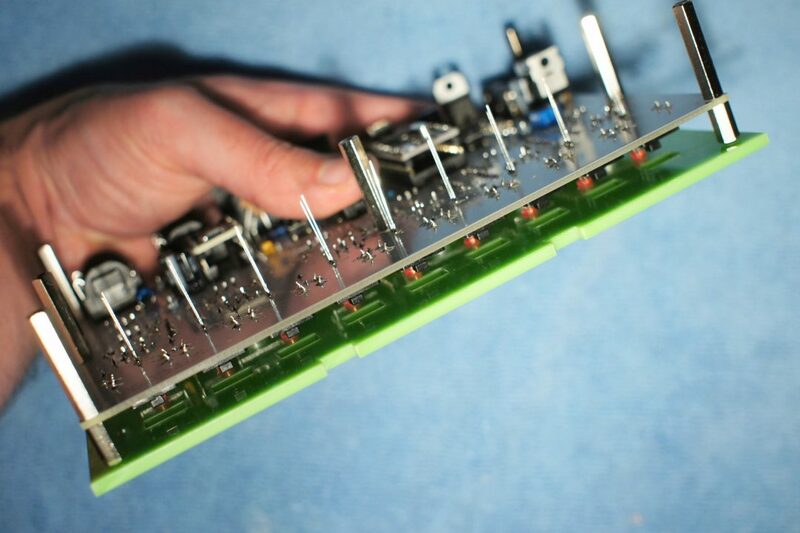 If not, then triple check your voltages, solder joints, IC orientations until you get a sound. Place and screw the LCD screen with the included M2.5x10mm screws and nuts, with a 3mm nylon spacer between the LCD and the board. Do not solder the lcd yet. 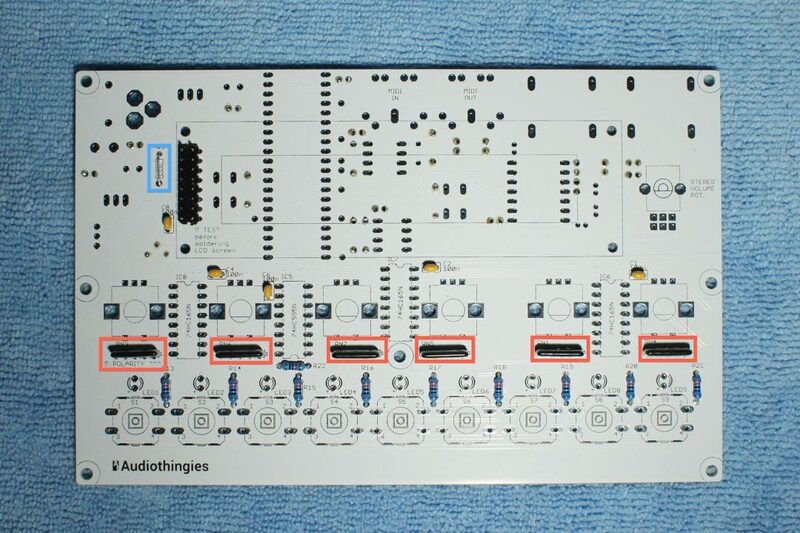 Check if you still have sound with a MIDI keyboard. If not, you may have a short between the board and the lcd. When everything’s fine, solder the LCD. Power the unit again, you should have the LCD working. Power the unit while pressing buttons 2 and 8. A screen will appear asking for an EEPROM Format. Press Load to confirm. 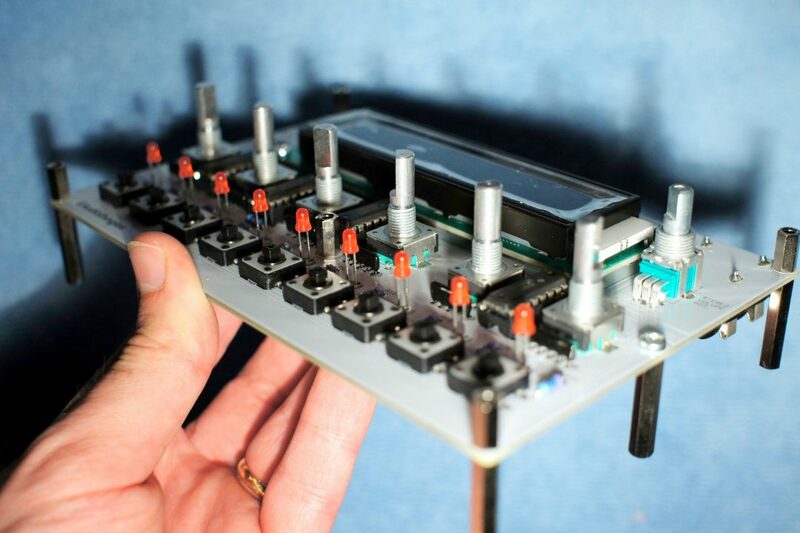 This will also write a few presets to get you started. Re-check polarity, longest lead (positive side) is on the side of the switch, not the encoder. Mount and screw the top panel with M3 black hex screws. 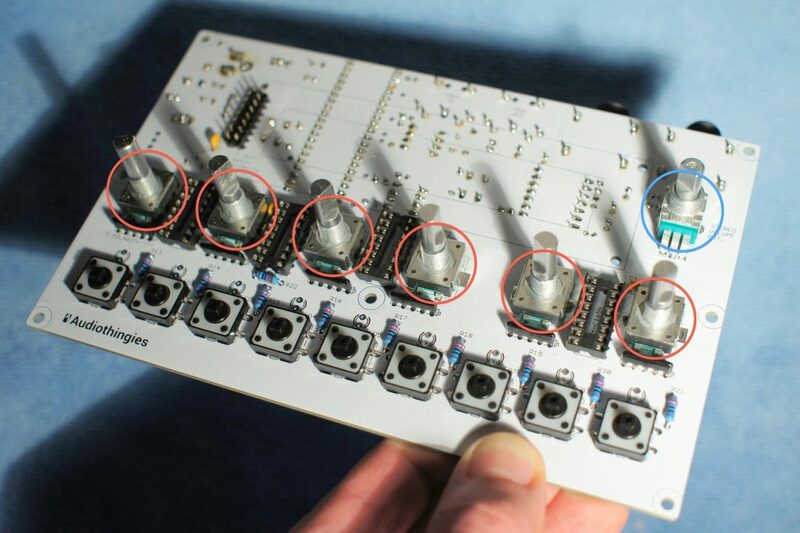 Slip the LEDs into their respective holes and solder them. This ensures the LEDs fit perfectly in their respective holes. 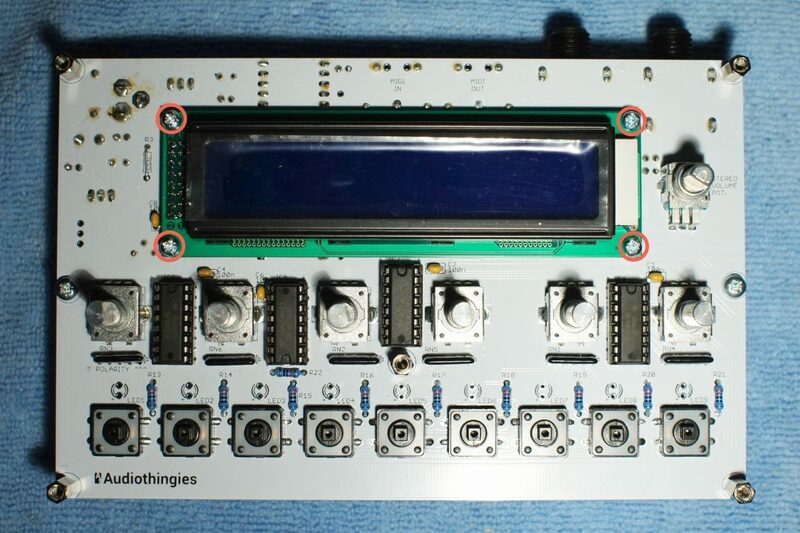 Power the board again, you should have LCD working, LEDs working and sound output. 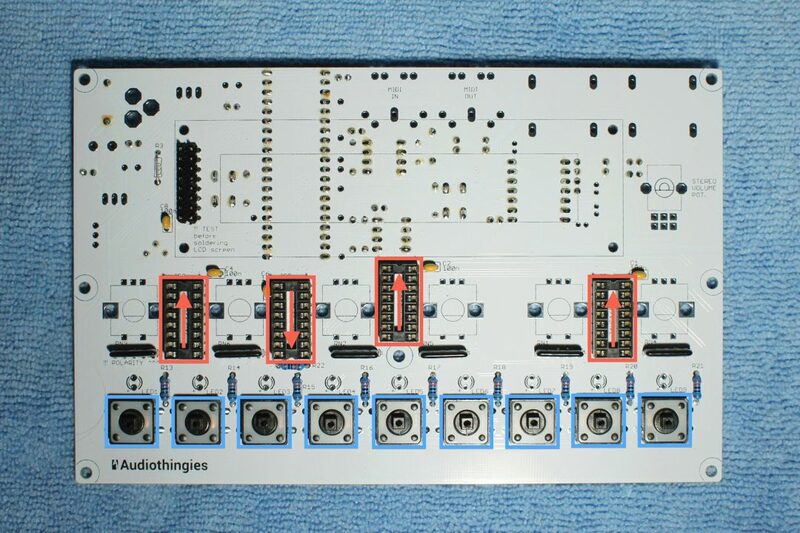 Play a bit with the P6 and check that everything’s working, buttons, encoders, etc… before mounting the unit into a case. The side panels are secured with M2.5x12mm black screws and nuts. Congratulations! It’s time for the Victory Candy! Now you can update your P6 to the latest version.